← Austrian crazy archer Otto enjoyed Peter O. Stecher’s Legends in Archery and got enlighted! Tennessee hunting licenses are required for hunting any animal that is native to Tennessee, and you may use the weapon of your choice as long as it complies with the state rules for that animal. State seasons and rules are strictly enforced. To check on state rules, regulations, season dates, and game limits, click on this TWRA link. Exotic animals (not native to Tennessee) may be hunted year-around, no licenses required, and you may use the weapon of your choice. Our lake is stocked and ready for action. You can fish from the bank, bring your small boat, or rent one of our boats to take out. You can catch and release great Largemouth Bass, clean or release Blue Gill and Catfish. There is a fish cooker available if you want to guarantee dinner. Tennessee fishing licenses are required while fishing our lakes. Goodman Ranch has a beautiful lodge with 4 rustic styled bedrooms and 2 large bathrooms. Each bedroom has all the necessities and includes 2 double beds. A large banquet room is available that can accommodate up to 35 people for events. The lodge contains a fully furnished kitchen, TV, DVD, VCR, WII Video games, stereo, fax machine, phone, wireless internet service, and a massage chair. 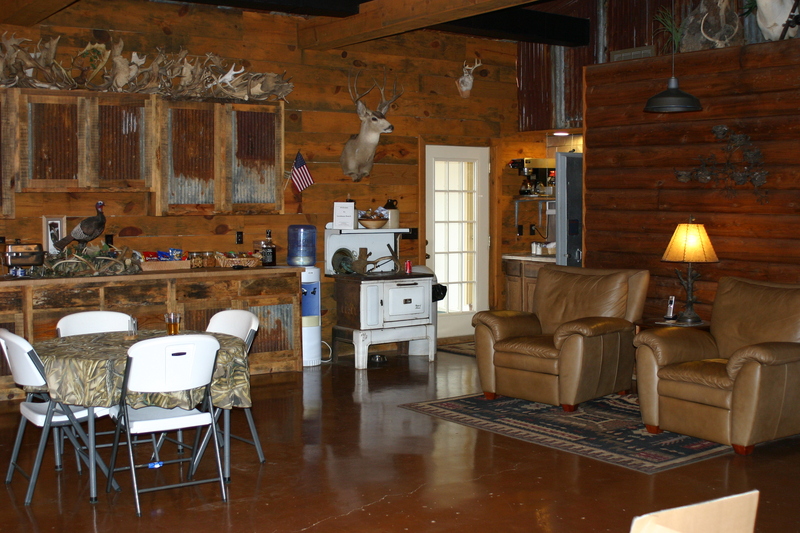 Individual cabins are also available within five minutes of the ranch. Sit around the campfire every night and enjoy the stars. We offer overnight stays without hunting for those who may want to get away for a few days and just relax in the quiet countryside. We have over 25 miles of trails to hike, bike, or trail ride on. You must bring your own horses or ATV to trail ride with. We also offer clay target shooting and crossbow shooting. If you want to get out of the woods one day, golfing at Chickasaw Golf Course in beautiful Chickasaw State Park is only five minutes away. The course was designed by Jack Nicklaus and is a very challenging course. Our ranch is blessed with wooded hills and green pastures. You will be spending time in pine and hardwood forests and open food plots. The views are beautiful and relaxing. 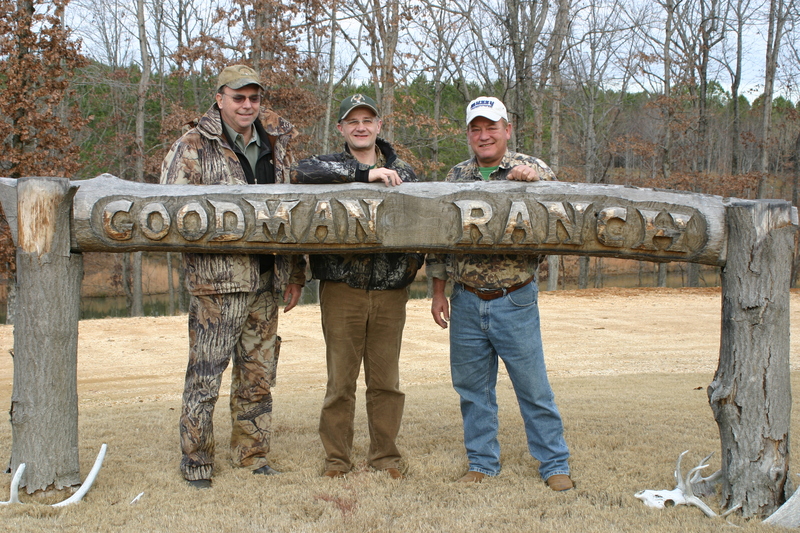 Mike Goodmann, Peter O. Stecher, Byron Ferguson at the Goodmann Ranch. Photo by Peter O. Stecher. Dieser Beitrag wurde unter 弓箭手 鹰眼 Bowman Magazine abgelegt und mit aerial target, Archery, archery school, Austria, Become the Arrow, big bucks, Books, bowhunting, Byron Ferguson, cooking, Fred Kaufmann, fun with archery, Henderson, hosting, Howard Hill, Howard Hill Archery, Legends in Archery, LegendStick, Longbow, Mike Goodmann, Peter O. Stecher, restaurant, rifle hunting, Tennessee, traditional archery, Trickshooting, trophy hunting, USA, Z-bow verschlagwortet. Setze ein Lesezeichen auf den Permalink.